For a small gathering of Harvard College students, their graduation celebration would be different from the norm. But for the 114 students who followed a different path through their undergraduate years at Harvard, “different” was just fine. The students, along with their families and friends, gathered in the Radcliffe Gymnasium on Dec. 6 to celebrate the 2012-13 Midyear Graduates Recognition Ceremony. The event recognized students who graduate in November or March, off the usual Commencement cycle. Students become midyear graduates for a variety of reasons. Some take time off for family or health reasons, others choose to explore an entrepreneurial dream or travel, and some industrious souls simply graduate early. For these students, the ceremony is of great significance because some are not able to return for Harvard’s annual Commencement in May. Evelynn M. Hammonds, dean of Harvard College, addressed the audience of graduating students, their friends, and family members. Hammonds also mentioned Helen Keller, author Michael Crichton, and basketball player Jeremy Lin as examples of Harvard graduates who forged unconventional paths to success. “Their paths may have been less obvious, but their influence has still been great — and you, too, have the ability to influence the broader world by cutting new paths,” Hammonds said. In the event’s prospective faculty address, Andrew Berry, lecturer and assistant head tutor in Organismic and Evolutionary Biology, drew upon the life of Charles Darwin to encourage graduates to maintain the academic connections and friendships that they had made at Harvard, and to continue to learn from those networking relationships as they left the institution. 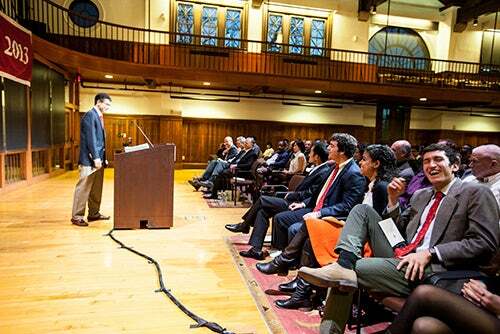 Speaking as one of the graduating seniors, Han expressed his thanks to the Senior Class Committee and the Harvard Alumni Association for coordinating the ceremony, and affirmed that taking “the road less traveled” had prepared the midyear graduates for success. Yo-Yo Ma and his Silk Road Project were there to help kick off the Deans’ Cultural Entrepreneurship Challenge, an initiative aimed at supporting the arts by connecting the worlds of art and business, Harvard’s student body, and the wider Harvard community.